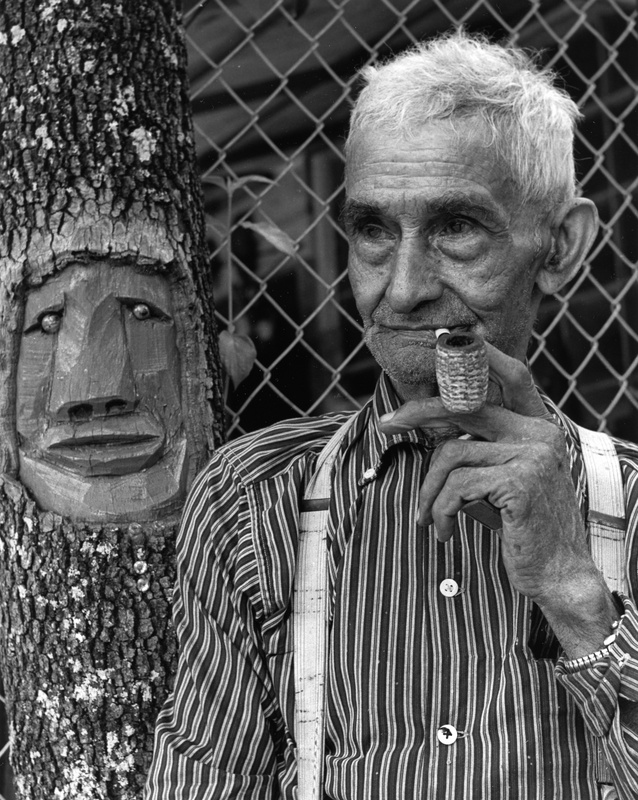 I first heard of Jesse Aaron and his wood carvings in 1968. From my very first meeting with Aaron, it was apparent to me that his unique work deserved to be seen by an audience wider than that which passed by his house or that had seen the few pieces displayed in a local outdoor art festival. Accordingly, I opened an exhibition of thirty-one of Aaron's works in the University of Florida Gallery on October 14, 1970. Several hundred people attended. The gallery opened at 1:00 P.M., and by 2:30 most of the sculpture had been sold. The next day, when I went to his house to tell him how successful the opening had been, Aaron's face lit up the darkened room with a wonderful smile, and holding both hands above his head, he performed a spontaneous dance of joy, a kind of jig that activated his entire eighty-six-year-old body and that I delight in remembering today. Jesse Aaron was born in Lake City, Florida, in 1887, into a black family with twelve children. As a child, he was hired out as a field- worker on a farm, and his formal education began when he was twenty-one and attended vocational school to become a baker. He eventually began cooking on the Seaboard Coastline Railroad, which coincidentally utilized right-of-ways where earlier he had "grubbed" [removed] stumps for ten cents each. This money, he later told me, was used to pay his poll tax. The artist's early farming experience remained with him throughout his life. He kept a vegetable garden for his wife, Lee Anna, a teacher, and his family until he died, and for many years he operated a nursery producing cut flowers for sale. Meanwhile, Aaron continued as a cook, working in hotels and at University of Florida fraternity houses in Gainesville. When he was unable to find work cooking, Aaron did cabinetmaking; the skills thus acquired contributed significantly to his technique as a wood sculptor. His earliest carvings were actually on trees marking the boundaries of his property; the faces grew larger as the trees grew. Other trees near his house were also carved with faces that the artist believed to be protective. In 1968, while Aaron and his wife were living in the house he had built on N W Seventh A venue in Gainesville, he discovered that Lee Anna was losing her sight. He realized in desperation that without a steady job, he would have no money for her cataract- removal operations. As he told it to me, one morning he awoke at 3 A.M. with the voice of the Lord still reverberating in his ears, saying "Jesse, Carve Wood!" He immediately arose from his bed, went into his small workshop, and carved the first of his small wooden sculptures. As the days passed, he continued carving small items from soft cedar that he got from a neighbor who sold kindling and firewood. Eventually, Aaron extended the roof of his house to the sidewalk and enclosed the covered space, creating a display area and a shop for selling his new wooden creations. He affixed two signs to this new addition; they read "Jesse J. Aaron, Sculptor" and "Jesse J. Aaron Museum." From that day forward, Jesse Aaron could generally be found there, receiving customers while seated in his sturdy lavender-painted rocker. Within his first year as a carver, Jesse Aaron had sold enough of his carved pieces to pay for the first eye operation, and Lee Anna was soon back to her sewing machine and quilt making. Aaron liked to add various found materials to his carvings, often attaching torn paper or articles of old clothing, scarecrow-like, or glass or plastic marbles for eyes. He occasionally created narrative commentaries, one of which shows a sheriff with a black prisoner and utilizes a pair of pliers as handcuffs and includes a toy pistol. Another work shows a shark with a small white plastic doll astride it and a plastic rattle in its mouth. Aaron's work has a visual similarity to the carvings of several traditional cultures of the Western Hemisphere—from the northwest coast of Canada to the coast of Peru—including Native American, African American and European American folk and naive wood sculpture; these actually correspond to his ancestry, which was African American, European and Seminole. The Seminoles, of course, had a long history of having absorbed non-natives-slaves and other runaways-into their culture; Osceola, their great warrior leader and heroic figure of the early nineteenth century, was himself of mixed racial background. Some viewers have suggested that Jesse Aaron's forms have their origins in African art. Aaron actually once became angered by several African pieces he saw in a museum because he thought that they were copied from his works, not knowing that they were nineteenth-century ritual objects. The artist and his works became widely known and acclaimed beyond Florida. His talent and achievement were further recognized through selection of his works for inclusion in "Black Folk Art in America 1930-1980," which opened at the Corcoran Gallery of Art in Washington, D.C., in 1982 and toured the country. Aaron's technique involves a combination of root sculpture and chainsaw carving. Most chainsaw carvers use fairly standard pieces of wood in their work, while most root sculptors seek out roots suggesting form and content to them. Aaron, on the other hand, would seek out wood that suggested imagery to him and, through carving, bring it out of the raw material into the open. His roughhewn images often contain highly expressive faces emerging from the germinal forms that retain the natural configurations of growth. When arthritic pain kept him from searching for wood, he hired college students to do it for him, but complained to collector William Arnett, "These guys don't know what to look for. They can't see it. Most of the time, what they bring to me I can't see nothing in it." Jesse Aaron was an American with both African and Native American ancestry. He spoke fondly of his Seminole grandmother and of her teaching him as a child to weave palmetto-frond fans and matting. But Jesse Aaron was also a man who lived and experienced a life of rich and unique dimensions. He took great joy in speaking with children, in showing them his work and listening to their interpretations. He had a natural strength of character that won everyone's respect. I remember well one of my earliest visits to Aaron, and how upon leaving I had two juicy red tomatoes from his garden thrust into my hands. "My friends don't leave me empty-handed," he said. Some months later I was admiring some papaya trees at his back door and commented that I'd learned to enjoy papaya as part of my breakfast when I'd traveled in Latin America. After that, whenever his papaya trees set fruit, I was never without papayas. Jesse Aaron didn't like a day to pass without making some small gift to someone. Today, through his wood carvings, Jesse is still generously sharing his largesse—nobody leaves empty-handed.